BUKIT Timah is home to one of Singapore’s latest outdoor murals, and what better name to give it than Uniquely Bukit Timah. Here, after all, is where you’ll find Bukit Timah Hill, Singapore’s highest natural peak, and 40 percent of the island’s flora and fauna. 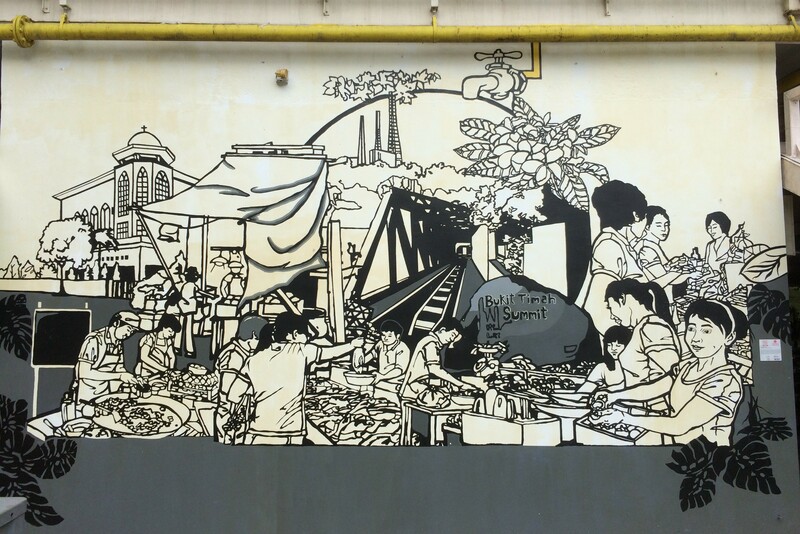 Central to this black-and-white mural, though by no means dead center, is a giant tap located a good three meters high, suspended artfully from a painted yellow pipe that tricks you into thinking it has branched off from a real, physical pipe, also yellow, that runs the entire length of the Bukit Timah Food Center’s northeast-facing wall. The touch of yellow is one reason why the stout, solitary tap seems to stand out more than the other images, each buzzing with so much more energy and verve. But there’s another reason. “It’s from this tap that the entire story flows,” said Alan Huang, Art Teacher at Pei Hwa Presbyterian Primary School, who designed and conceptualized the mural, and led the painting initiative with two of his fellow art teachers, Gan Lu and Wong Kee. Spearheaded by the National Environment Agency (NEA) and initiated in mid 2014, this project has seen some 134 artworks across 45 hawker centers throughout Singapore. And what exactly is this place about? Run your eyes from the left of the mural to the right, you’ll spot our chai tao kueh “carrot cake” man, the wet market folks from the fishmonger to the vegetable seller to the fruiterer to the grocery lady. And somewhere in this joyful bustle are the makeshift tentages that once graced the old market—located, at least four decades ago, across the road from the present one, where Beauty World stands today. The food theme, it seems, frames the other stories: the fabled foliage, flora and fauna as embodied by the Bukit Timah Summit and the Bukit Timah Nature Reserve, and the immediately recognizable landmarks—Pei Hwa Presbyterian, the now disused railway track, and the tall and proud communication towers on the distant hill. If the giant tap could flow with even more hometown tales, it would tell you how all 115 Pei Hwa staff and teachers—artists and non-artists alike—worked tirelessly over three days in early June, across double-hour shifts, four per day. They painted methodically, working their way left-to-right, top-down, across sections that resembled three giant jigsaw pieces—one piece for each day. The painting isn’t as complex as one would imagine, for the teachers had cleverly stenciled the outline by projecting the image on the wall four days before the big day, using an oil-based, water-resistant marker. When the painting got underway, the staff and teachers found friends in the ground-floor shop owners. Hau Chiew Yen, the seamstress whose shop sits just behind the wall, hardly winced when the painters trampled on the grass patch fronting the mural, killing most of her bitter herbs. Instead, she offered Madam Gan, Mr. Huang, and Madam Wong not just drinks, but stools to camp out all through their three-day, four-shift supervision. And when the tentage the staff had erected collapsed on the second day at the second shift, some two or three unknown hawker heroes flew to the rescue, helping to steady the framework from the second floor. The mural couldn’t have told all these stories, alas! But that’s just how hometown tales are—they’re best spread by word of mouth, exactly as the neighborhood would have it. This article first appeared in “We Love Bukit Timah,” a Bukit Timah Community Newsletter. Free copies of this newsletter are available at the Bukit Timah Community Club.